There is talk that Vaseline is the miracle cure for helping give your brows a boost! Let’s find out how to use vaseline to get thicker eyebrows. Long gone are the days where thin and sleek eyebrows are fashionable. Now women prefer framing their faces by having thick, bold and luscious looking brows. Not all women are lucky enough to have beautifully bushy brows, especially if you have been tweezing heavily for years. Vaseline is a brand of petroleum jelly which has been used as a manufacturing component of beauty products for a number of years. It’s curing potentials came about from oil workers who were using residues from the rig pumps to help soothe cuts and burns. These healing elements were extracted, and this is how petroleum jelly came about. The name Vaseline actually derives from a hybrid of the German for water and the Greek for olive oil. Most know Vaseline as being a staple for moisturizing lips and it was originally used as a protective barrier to keep air, water, and bacteria away from wounds. However, there are far more uses to this skillful slick! Here we will discuss the usage of vaseline for eyebrow growth. Did you know that Vaseline can be used for preventing windburn, eliminating lice, shining leather bags, helping slow battery corrosion in cars and strengthening brittle nails? Can Vaseline Be Used for Eyebrow Growth? 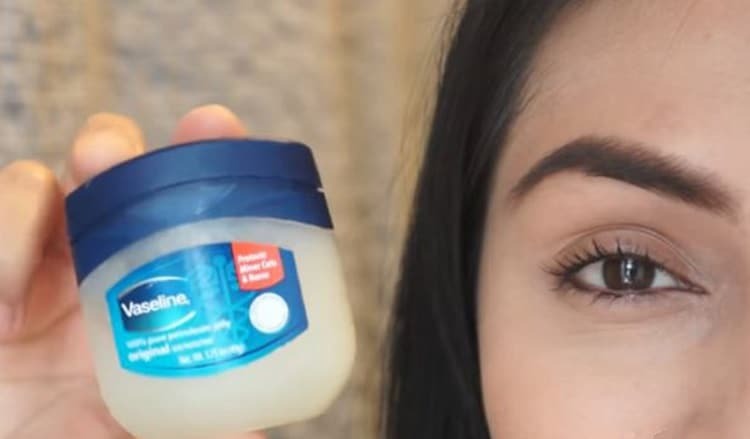 Many swear by the benefits of using Vaseline to help increase eyebrow growth. There are a variety of products on the market that claim to do the same thing but when you are using serums to close to your eyes, you need to be careful about any chemical and manufactured products. Aside from being dangerous to your eyesight these synthetic substances can also damage the roots of the hair which can lead to weakening. It is a very simple process that takes little effort and zero skill to use vaseline on eyebrow! Cleanse your face thoroughly, ensuring that any makeup, especially on your brows, is removed. You can either use your fingers (or an old but very clean mascara brush or a cotton swab) and apply a small amount of the Vaseline to your brows. Massage into the hairs for around 20 seconds and then leave overnight. Simply wash the Vaseline off in the morning when you wake. Any sort of hydrating oil-based product is good for helping with hair growth. The intense moisturizing and conditioning components within Vaseline can enrich the eyebrow hair making them grow naturally longer and thicker. However, the same can be said for using an organic olive oil or a pure coconut oil. The added benefit of Vaseline is that it is very cheap to purchase, can be used for a variety of other purposes and is available in most shops – making it a more popular choice for boosting the eyebrows! Vaseline is a universally accepted petroleum jelly. Try using vaseline for eyebrows to get them thicker and longer.